There is nothing more beautiful in this world than a mysterious woman. Her beauty lies in the strength of her choices and the conviction with which she believes in herself. She is not bound by the shackles of reason and logic. She creates her own world wherever she goes and everybody is happy to follow. 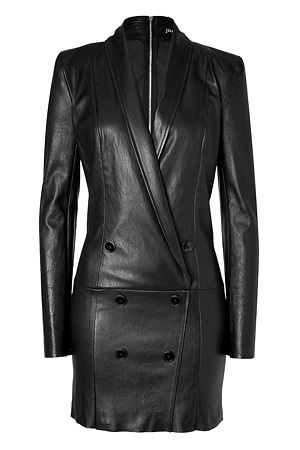 The Selenix six button jacket leather dress was created to embody the spirit of this woman. The sleek open collar look combined with the new age button finish closure adds strength and attitude to the casually sensuous grace of a woman who owns hearts by default.